The Wyoming Democratic Caucus is coming up on Saturday, April 9 and stakes are high for both candidates, especially since Bernie Sanders' latest run of big wins in Alaska, Hawaii, Washington, Idaho, Utah, and most recently, Wisconsin — six straight states in a row. Wyoming isn't a huge state for the candidates, with a total of 14 proportionally allocated delegates and four superdelegates at stake. However, any and all delegates are important for the Sanders camp, whose latest strategy has changed from just winning, to winning big. And Sanders did win big in Wisconsin, with a 10-point lead on his opponent and Democratic front-runner Hillary Clinton. With the big day just around the corner, how many Wyoming counties hold caucuses? Wyoming's presidential caucus process is called the County Caucus, which is where voters choose their presidential nominee. 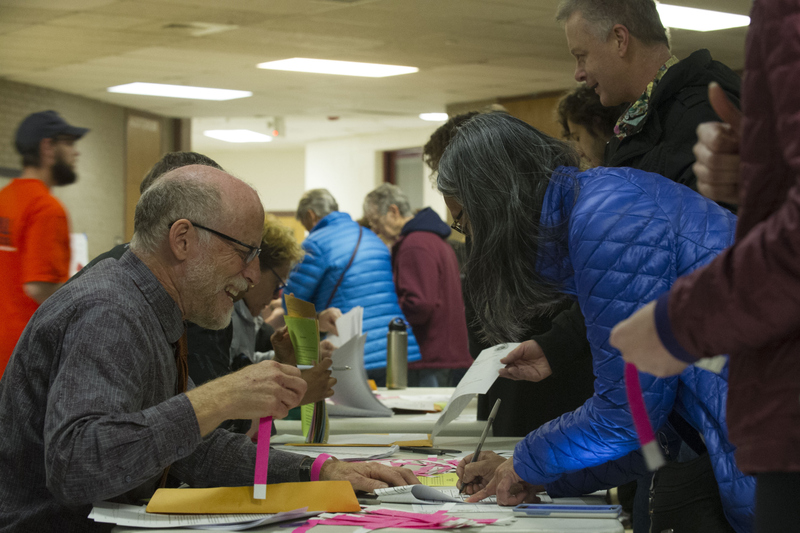 Voters who are planning to make their voices heard in Wyoming will go to their county polling place, where people will speak in support of their preferred candidate. There are a total of 23 counties holding caucuses in the state on Saturday, and anyone planning on participating must be in line by 11 a.m. MT. Because Wyoming's caucuses are closed, you can only vote on Saturday if you are a registered Democrat in the state, as well as a Wyoming resident. There is little to no polling data on Wyoming ahead of the caucus, but Sanders has typically done well in states that hold caucuses. He won in Alaska, Colorado, Minnesota, Kansas, Maine, Nebraska, and Hawaii — all states that hold caucuses instead of primaries. Even with little polling data available, USA TODAY noted that Sanders has a slight lead over Clinton in Wyoming, calling it a state that "has a smaller population than the nation's capital." Ahead of the caucuses, both candidates' campaigns made visits to Wyoming. Sanders himself was there for a rally on Tuesday, as Wisconsin's results came in, and former President Bill Clinton made an appearance there for Clinton on Monday. Sanders encouraged his supporters to hop on the "revolution" train, stating, "Let us see on Saturday a record breaking turnout here in the Wyoming caucus and let us have Wyoming Democrats making it clear that this great state is part of the political revolution." Clinton has focused more of her attention on New York, where primaries are taking place on April 19, and where there is certainly more at stake. Regardless of how small Wyoming's population is, never forget that every single vote counts. If you are registered to vote in the Cowboy State, make sure to check your polling place online and head out to your county caucus.